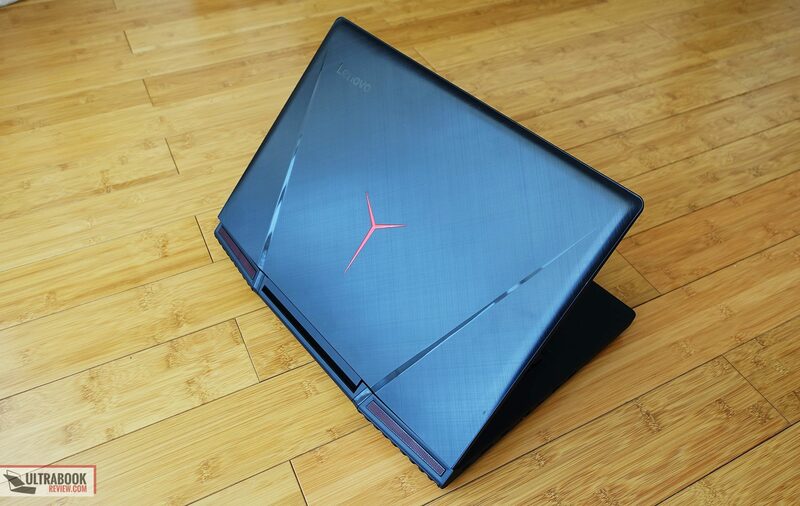 Summary: The Lenovo Yoga Y920 is one of the most complete full-size big-screen gaming laptops available out there. It's well made, it looks exquisite, it gets a great IPS panel with GSync support and a mechanical keyboard that makes it stand out of the crowd. 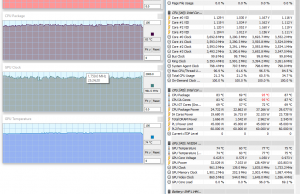 It also squeezes solid performance out of the powerful hardware inside, yet there's room for further tweaking both the performance and temperatures. You'll find more about these and all the other aspects of this notebook from the detailed review below. 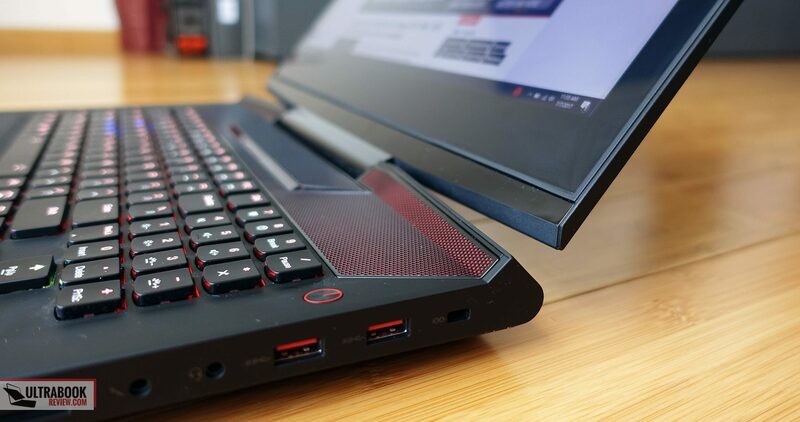 If you’re after performance in a well built laptop with a big screen, the Lenovo Legion Y920 is one of the newer options you should consider. 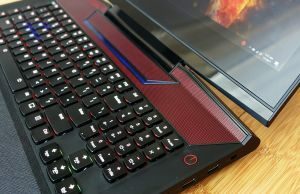 It’s a full-size machine that weighs about 10 lbs (12 lbs including the power brick), one that offers a 17-inch IPS screen with G-Sync support, a mechanical RGB keyboard, a 2.1 speaker system, a large battery and modern hardware, with Intel Core HK processors, up to 64 GB of RAM, Nvidia GTX 1070 graphics and fast storage. The Legion Y920 faces competitors with very similar traits and form-factors, like the Dell Alienware 17, Asus ROG G752VS, MSI GT73/GT75 Titan and a few others (there’s a longer list here), each with their pros and lacks. On a first glance, what sets it apart from the crowd are the design and build-quality, the keyboard and in most regions, the price. 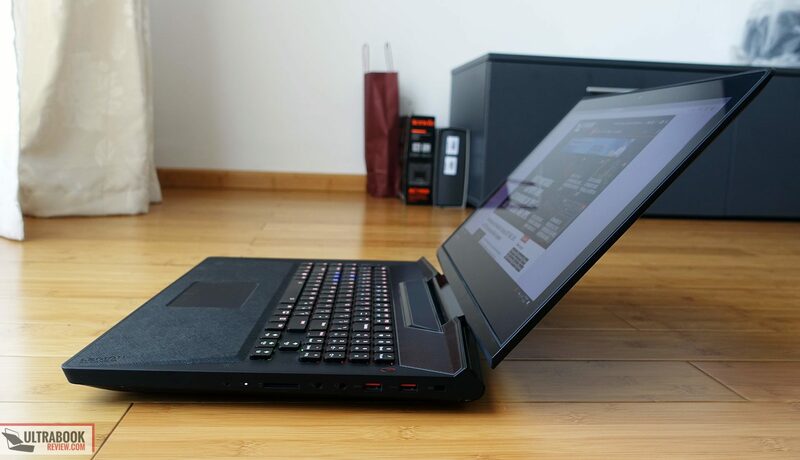 However, there’s more than meets the eye beneath the surface, and we’ll talk in-depth about every aspect of the Lenovo Legion Y920 in the review below, so by the end of it you’ll know if this notebook should be your next or not. 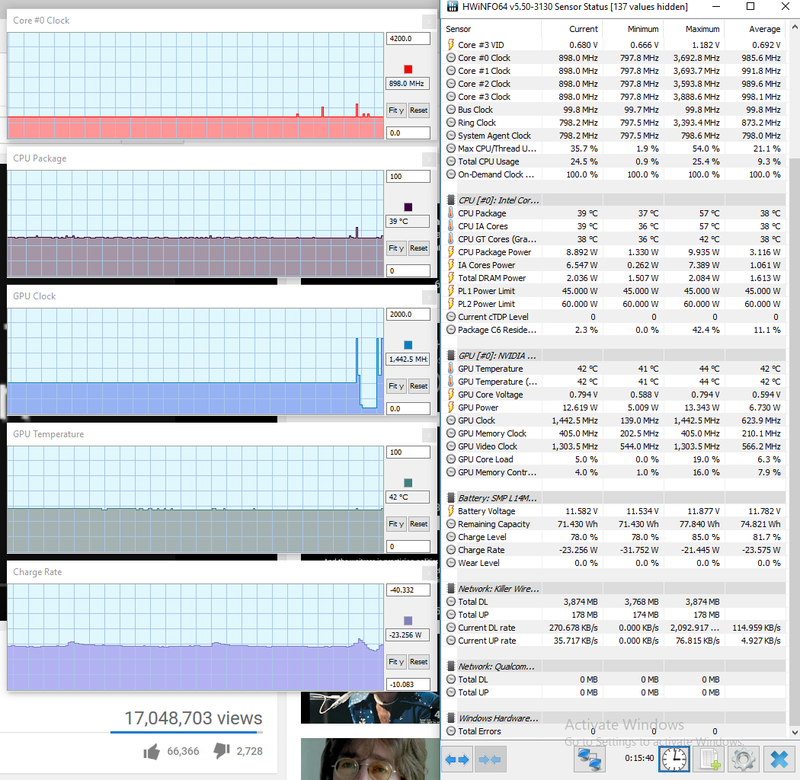 I’ve mentioned the design and build quality as some of this laptop’s main selling points, and here’s why. 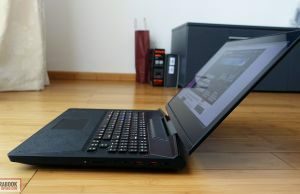 First of all, most laptops in this category are sturdily built, because when portability is not a concern, there’s no need to cut any corners when designing the chassis and picking the materials used for the interior and outer shell. I do feel this Legion is a notch above the competition though, with both the main-deck and the screen being very well crafted, with almost no give and flex. 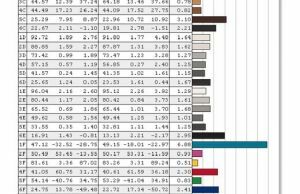 As far as design goes, most OEMs go with “gaming lines”, which means light bars, aggressive cuts and various striking accents, usually red or orange. This Legion is a bit more tamed down, being mostly black, with only a few dark-red meshes towards the back side, on top of the cooling exhaust, and on the interior. The lid is very clean, and while the Legion logo is backlit (by the display’s panel) and cannot be switched off, it’s easily one of the coolest and simplest lid-lights I’ve seen. There are also two light bars on the interior, one on top of the keyboard and another framing the trackpad. 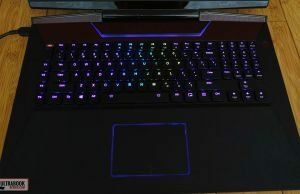 Both are customizable though Lenovo’s included software and while they can’t be switched off independently from the keyboard (there is a profile called NoLights that siwtches off the keyboard and these light bars), they are RGB and can be set to Black, which pretty much does the same thing as switching them off. Aside from these, I also like the branding elements on this laptop, muted and well integrated withing the overall scheme. 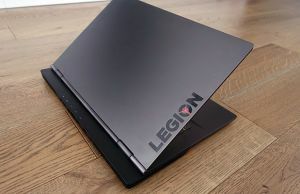 The Lenovo logo on the hood is black and barely distinguishable, the Lenovo logo under the hood is dark-grey, fairly small and placed towards the sides, while the Legion branding on the palm-rest is black as well and just engraved into the rubbery material, enough to notice, but not too obvious. 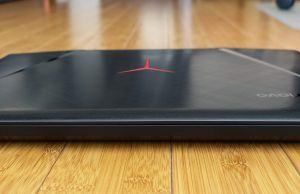 These might not matter much to many of you, but in a segment filled with notebooks that scream GAMING to your face, this Lenovo is nice breath of something else. 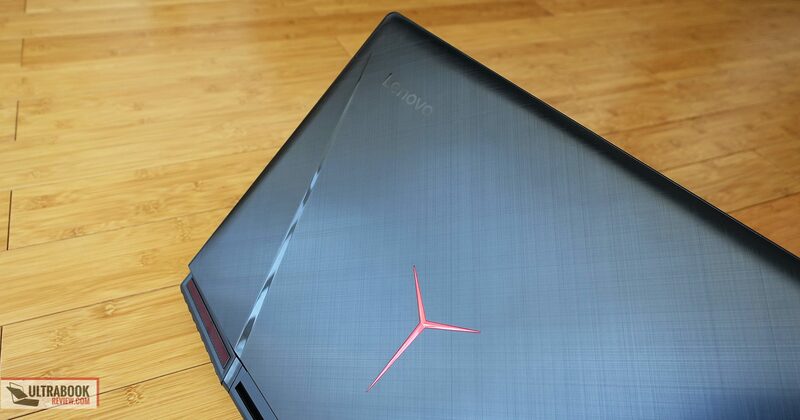 For the materials and finishing, Lenovo went with dark brushed aluminum for the hood and underside, which looks exquisite, but will of course show smudges easily. The interior is made from a few types of plastic. 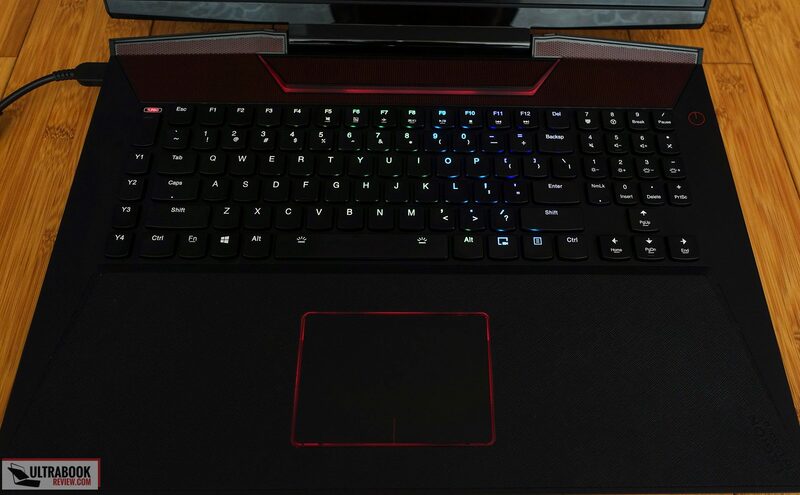 There’s that dark-red mesh on top of the keyboard, which integrates the light bar and hides the speakers beneath, then there’s smooth black plastic around the keys and lastly there’s a textured rubber on the palm-rest. This left me with mixed feelings. On one hand it’s grippy and doesn’t show sweat, on the other I feel it might catch dirt and wear off over time, so I don’t know how well it will look a few months and years down the line. That’s nitpicking though. The glossy plastic used for the hinge and the part beneath the glass that covers the screen, that’s without a doubt an unfortunate choice, first of all because it looks cheap, second because it will scratch and look awful, and third because it reflects the keyboard’s lights if you’re using the laptop on a higher desk and don’t have the screen leaned back past 100-110 degrees, albeit that’s not going to happen with regular use. Speaking of that, the hinge on this Legion is pretty well built and works smoothly, allowing the display to go back to about 135 degrees and be easy to lift singlehandedly. 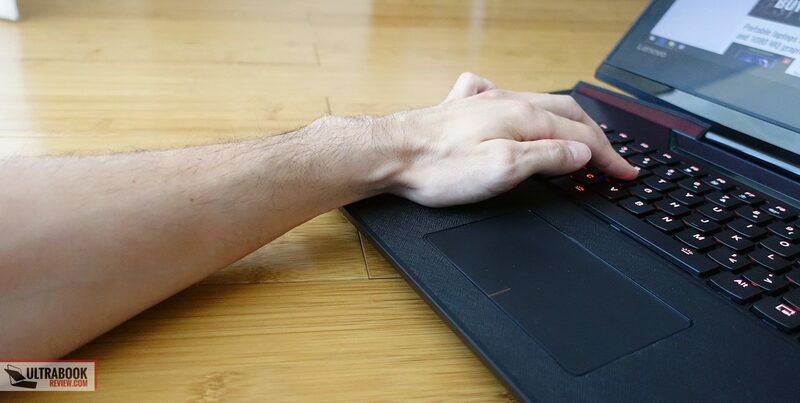 However, just like on the Legion Y720, I feel this hinge is a little weak and fails to keep the screen fixed in place when grabbing and moving the laptop. But let’s see how this notebook feels in daily use. I’ve already mentioned the palm-rest, the hinge and overall build quality. I’ll also mention that its rubber feet, albeit rather small, keep it well anchored on a flat surface and the palm-rest is spacious enough so your wrists won’t be bothered by the otherwise tall front-lip. There’s nothing wrong with the edges, corners or joints though, which are smooth and don’t leave any sharp bits exposed. Flipping this Legion Y920 upside down you’ll notice those rubber feet, as well as some serious in-take cuts and a red triangular mesh that hides the subwoofer beneath. 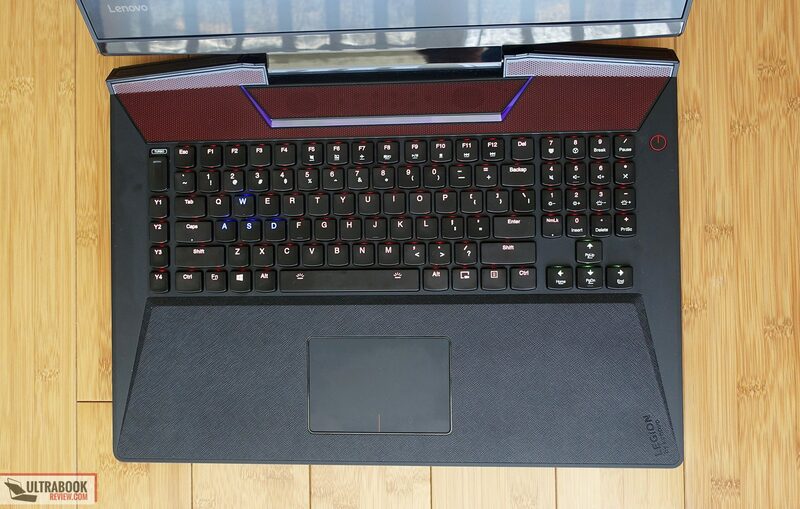 The main speakers are placed on top of the keyboard, so that means this notebook gets a 2.1 audio system. Down here you’ll also notice two glossy plastic cuts on the sides, which I’m not sure what they’re meant for. I’d assume they’re extra intakes, or they could act as extra space for the low-sounds to get out, or perhaps a mixture of both. Regardless, they’re ugly, but that doesn’t matter since you’ll never notice them down there on the belly. 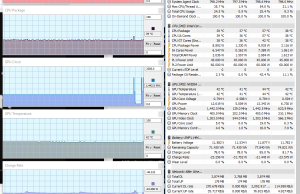 As far as the IO goes, there’s everything you’ll ever want on this laptop, lined on its left and right sides. 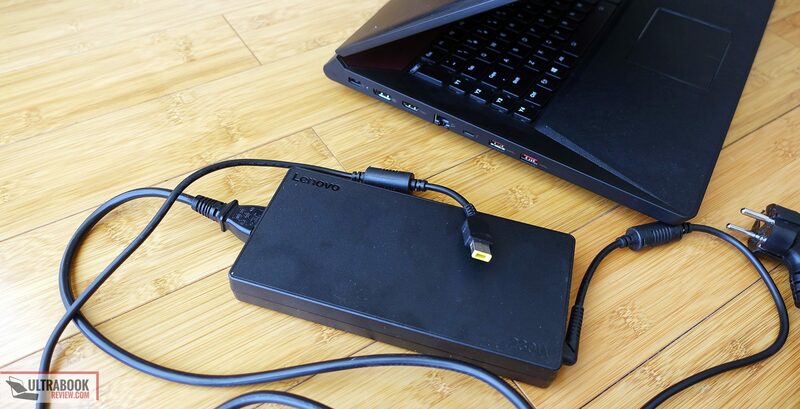 That includes 4x USB 3.0 Type A slots, an USB 3.1 Type C with Thunderbolt 3 port, HDMI 2.0 and full-size DisplayPort for video output, a card-reader, a LAN port and separated mic and audio jacks. 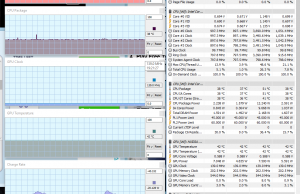 Most of these are placed on the left edge, which will leave the right uncluttered for a mouse, which right-handed users will surely appreciate. 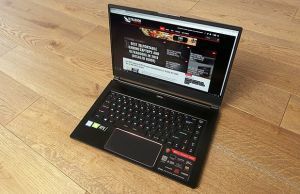 The keyboard is one of the main aspects that set this laptop apart from other devices with similar traits. 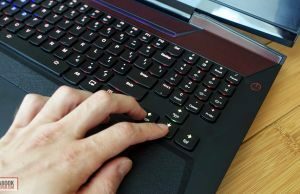 It’s a low-profile mechanical keyboard, and it feels nor like a standard notebook keyboard or as a desktop mechanical keyboard. 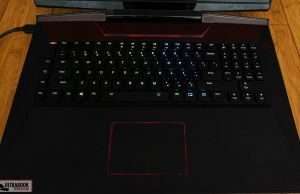 According to Lenovo it uses Cherry MX switches, but it doesn’t feel like anything I’ve used before and I couldn’t find out exactly what kind. 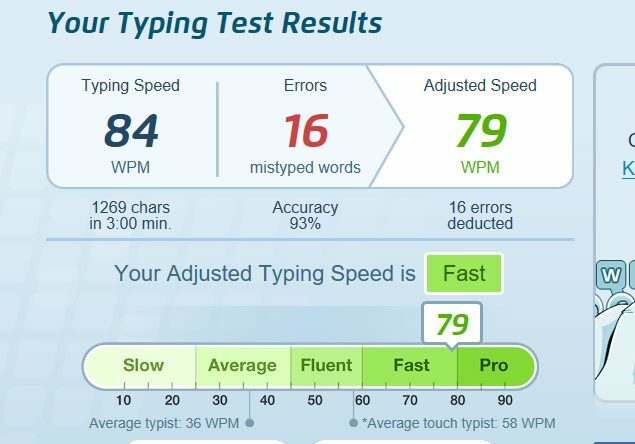 The typing experience is odd, both because of the deep stroke (2.2 mm) and especially the increased resistance. These keys are hard to push and they have a deep actuation point, which means you can’t touch type like on a normal mechanical keyboard, you need to make sure you press them all the way down. That meant that as a person used to low-stroke mid-resistance keys, I initially hated their feedback. Several thousands words later though, for me this keyboard is now one of the fastest laptop keyboards I’ve ever gotten my hands on. I still can’t say it’s one of my favorites, I’d probably need more time to get used to it, as I still have to adjust my style and remember to hit those keys hard, otherwise missed strokes start happening. 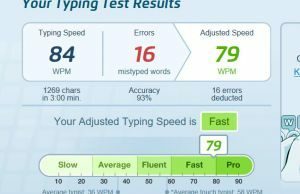 In fact, I still struggle to reach a consistent typing accuracy of at least 95%, and most of the errors tend to occur when I have to use the Shift and Space keys. 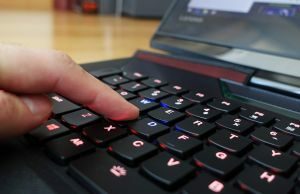 This keyboard is also on the loud side, as you’d of course expect from mechanical switches with their distinctive click. This is a lot quieter than even a desktop Cherry MX Brown keyboard, but also louder than a regular laptop keyboard and not well suited for typing in a library and other quiet environments where people could give you a raised eyebrow if you stand out in any way. For gaming, this comes with anti-ghosting and fast response time. The layout also makes sure the arrow keys are nicely spaced and separated from the others, but it’s similar to the other Legions, with an unusual NumPad Section with no dedicated function keys like Home, End, Delete, PrtScr, etc. 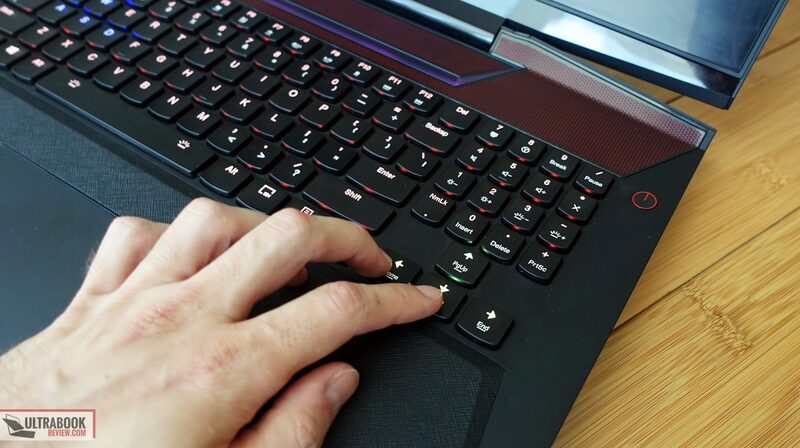 That’s one more reason I believe this is not a keyboard for professionals who use those keys on a daily basis, but something more appropriate for gamers. 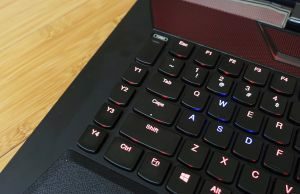 I do like how the secondary functions are integrated on the NumPad and not on the F keys like with most other laptops. 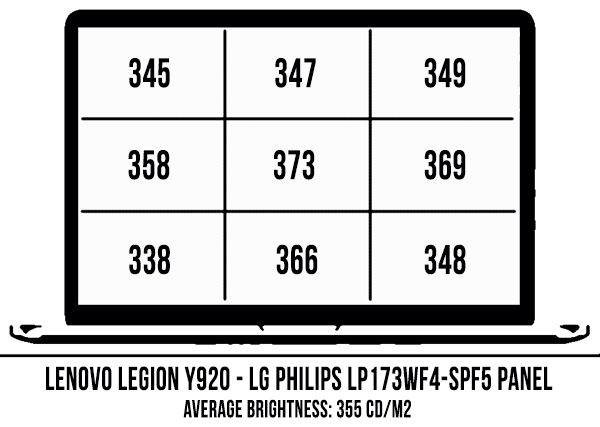 As an addition from the other Legions, the Y920 also gets four macro keys and a Turbo toggle as the most-left column of keys. They are customizable and the Turbo key is actually a switch that slides up and down in a very nice way. However, I find the positioning annoying, as I always seem to hit the Y4 button instead of the left Ctrl, so I had to make sure there was no function assigned to that key so at least constantly hitting it wouldn’t do anything unwanted. Another selling point here is the RGB backlightning. 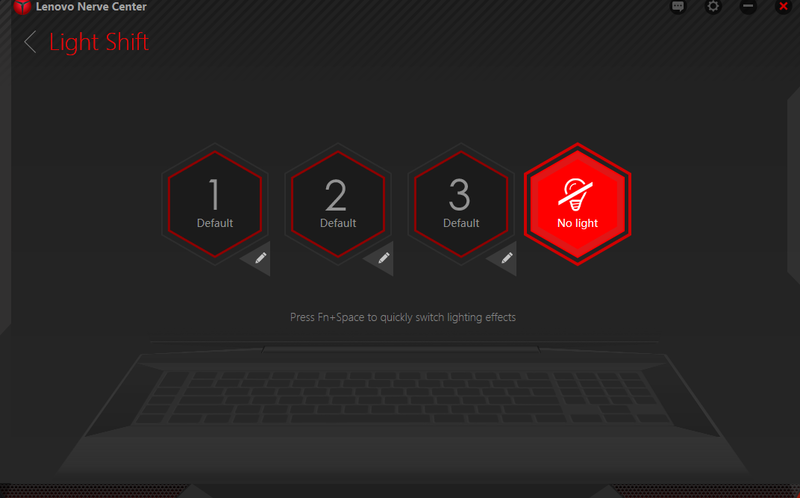 The included Lenovo Sense app allows to individually customize each key’s color and effect, customize certain areas of the keyboard or choose general effects for all the keys. 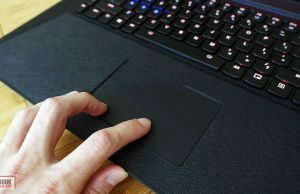 The trackpad is also framed by a lit border that you can customize from the same app, which also gives control over the color-bar at the top of the keyboard. 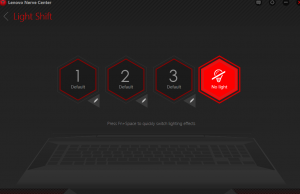 The app allows to create three different profiles for the keyboard, trackpad and light bar, as well as a general Lights-Off profile, and you can toggle between them by hitting Fn+Space. 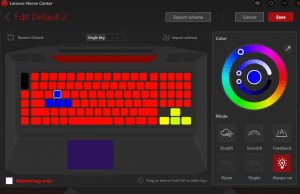 As a side note, I couldn’t figure a way to turn the light bar and trackpad off independently from the keyboard, while keeping the keys backlit, but I found that switching their color to black ends up completely muting them. 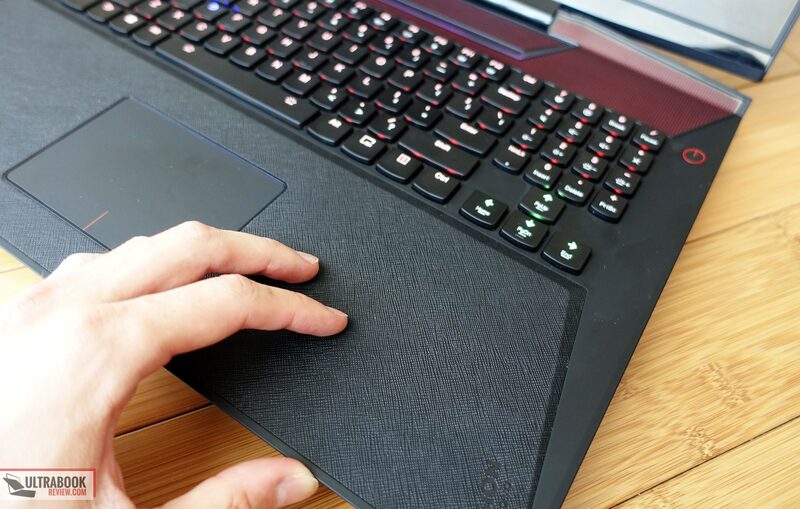 As far as mouse goes, Lenovo went with an Elan made clickpad here. It’s plastic, but it feels nice to the touch and has a smooth matte texture. 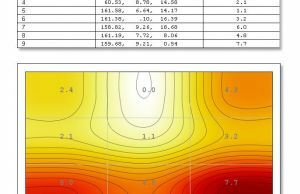 It also works surprisingly well for an Elan surface. 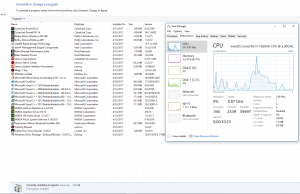 In fact, with the exception of the lack of Back swipes in browsers, I couldn’t find anything that I didn’t like about it and I didn’t run into any sluggishness or stuttering during my time with the laptop. 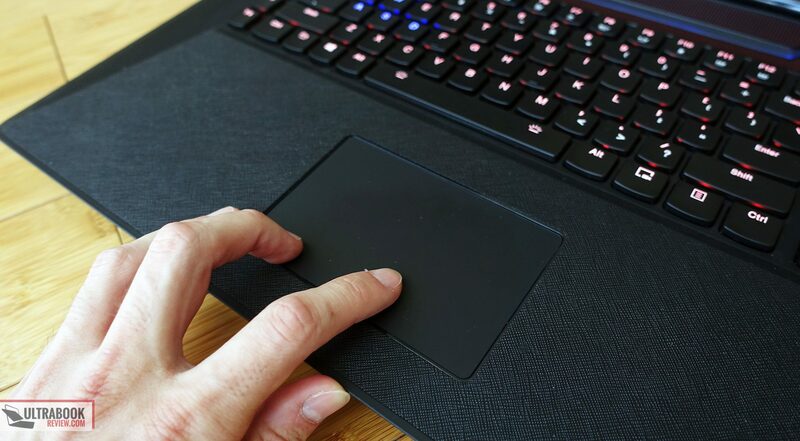 As a clickpad, the click buttons are integrated within the surface, but they work smoothly and aren’t stiff. They’re a bit loud though. 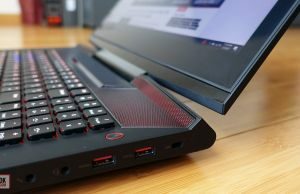 For the screen Lenovo went with a 17.3-inch IPS panel with a 75 Hz refresh rate and GSync, which makes it a great pair for the GTX 1070 graphics inside the laptop. 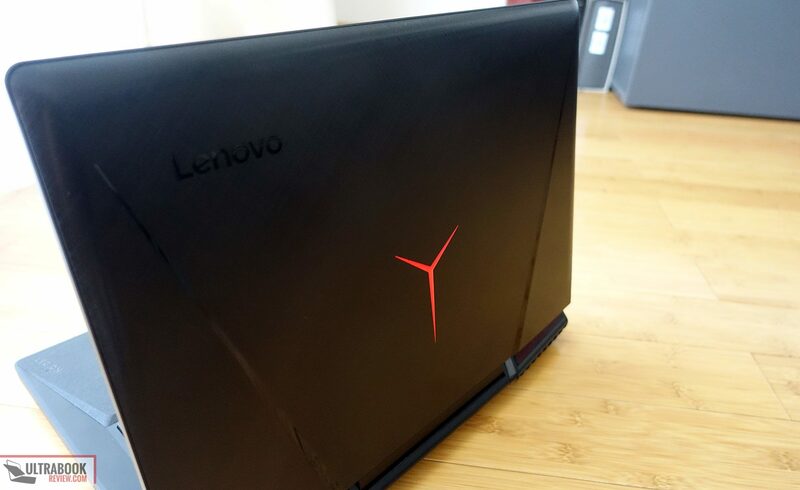 However, Lenovo decided to put a layer of glass on top of the panel, with what they call an anti-glare finishing. I’d reckon this helps over-strengthen the screen chassis, which does feel very well built as already mentioned earlier, but it’s also reflective. 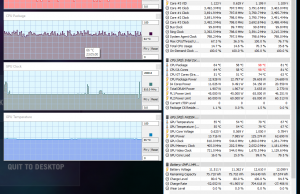 You’ll say that’s not much of an issue on a laptop that you’ll mostly use indoors anyway, in dimmer conditions, but the screen also reflects the keyboard’s back-lightning in certain conditions (when it’s not leaned back much). 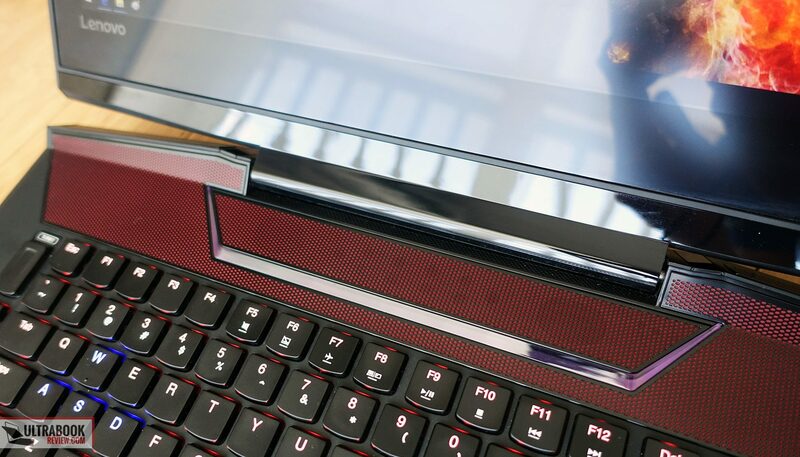 On top of that, there’s also that glossy piece of plastic underneath the screen which reflects the keyboard as well. 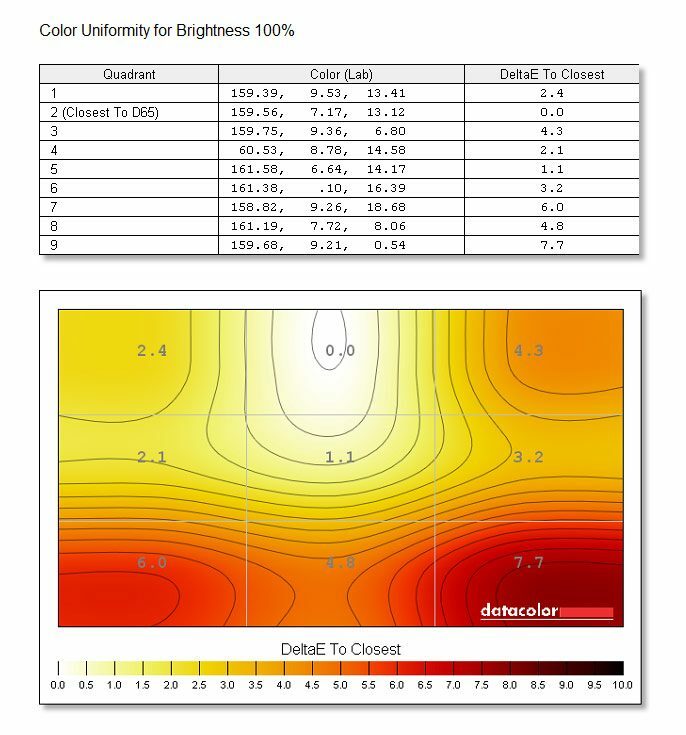 However, as long as you have a lower desk and you lean the screen back past 110 degrees, you’re not going to notice these aspects. 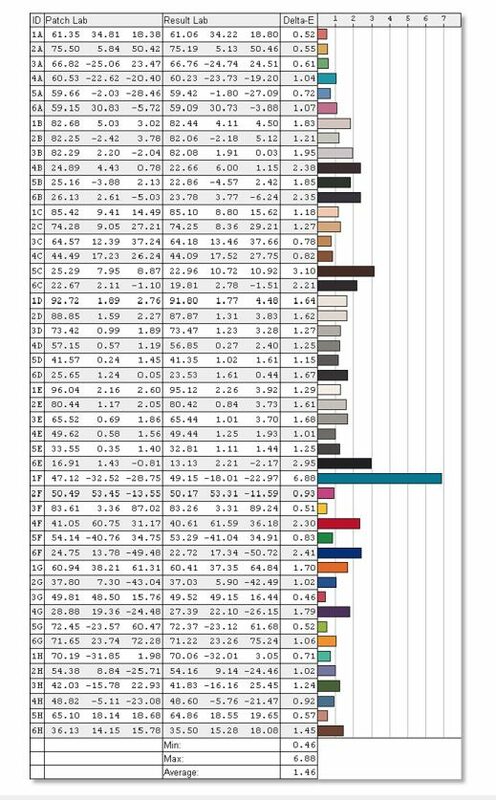 Back to the panel, there’s little wrong about it, especially once properly calibrated (our calibrated profile is available here), as gamma is a little bit skewed out of the box. If not for the glare, at 370 nits of brightness, 800:1 contrast and fairly good color coverage (72% AdobeRGB), this would be nearly flawless. More details below. 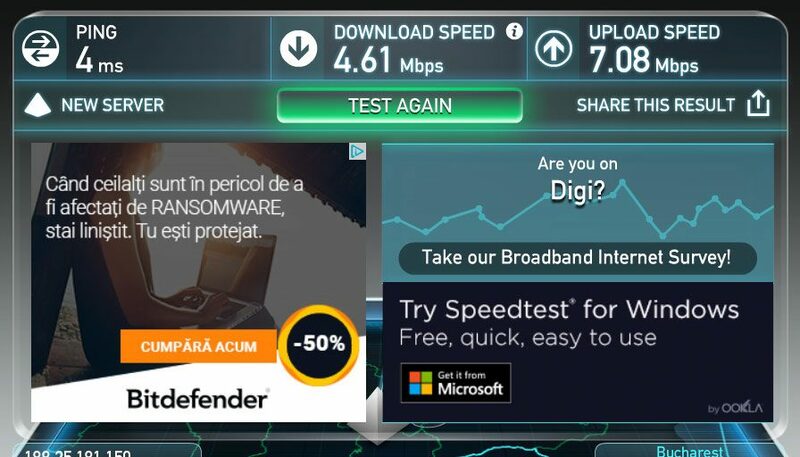 Average DeltaE: 1.46 uncalibrated, 1.17 calibrated. 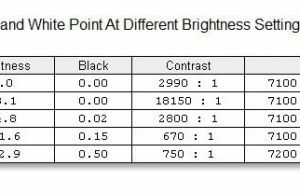 Of course, there are higher-gamut panels out there and those of you into professional graphics work will better go for one of those. 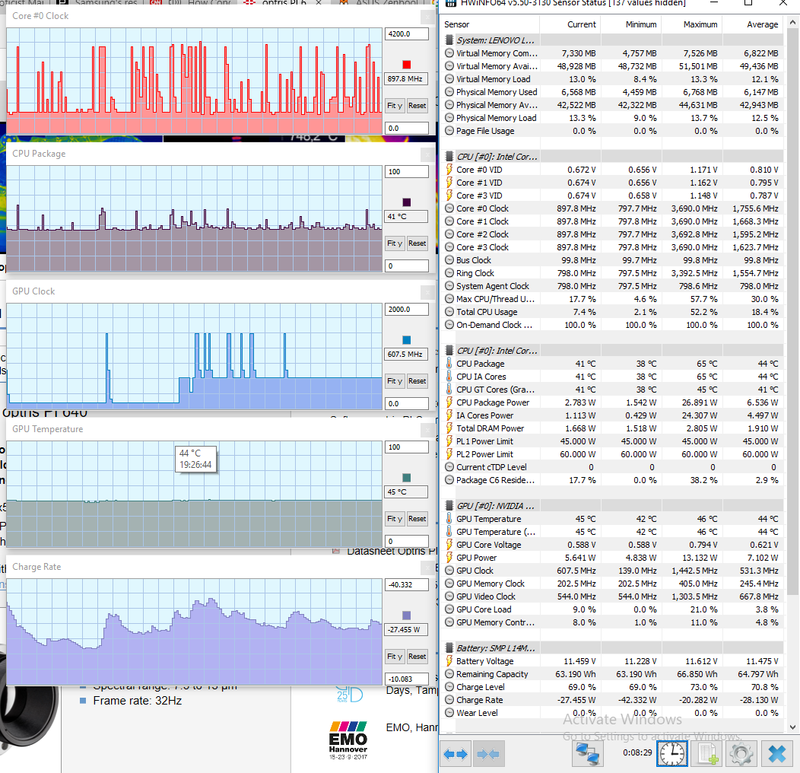 There are also higher resolution panels and even panels with lower response times (TNs though). 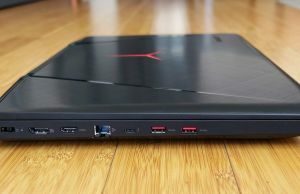 But keep in mind the Lenovo Legion Y920 is a gaming notebook, and for that reason the screen choice is one of the best matches for a 17-inch gaming laptop at the time of this post, as you’ll be able to run any game launched in the next few years at 1080p resolution and high settings. 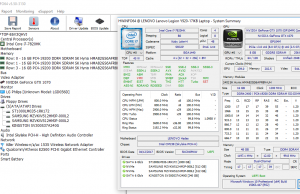 The 75 Hz refresh rate and GSync help with the gaming experience as well. 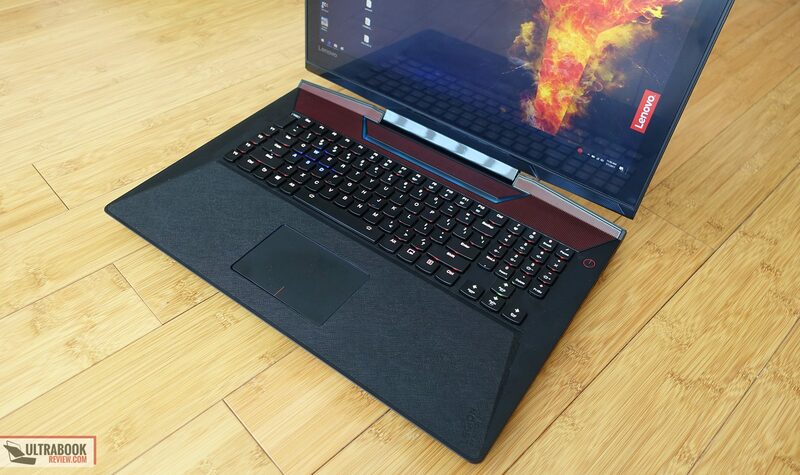 Lenovo offers this laptop in a few different configurations, with Intel quad-core processors, Nvidia GTX 1070 graphics and various amounts and types of storage and memory. 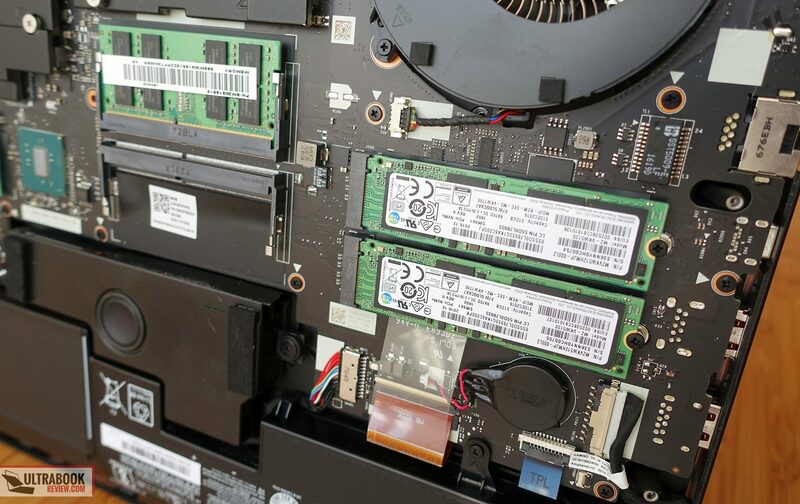 There are fours RAM slots inside, as well as two M.2 80 mm NVMe slots and a 2.5″ bay for storage. With two M.2 slots you can have NVMe drives in RAID0 configurations for increased speeds, which is exactly what we got on our test sample. 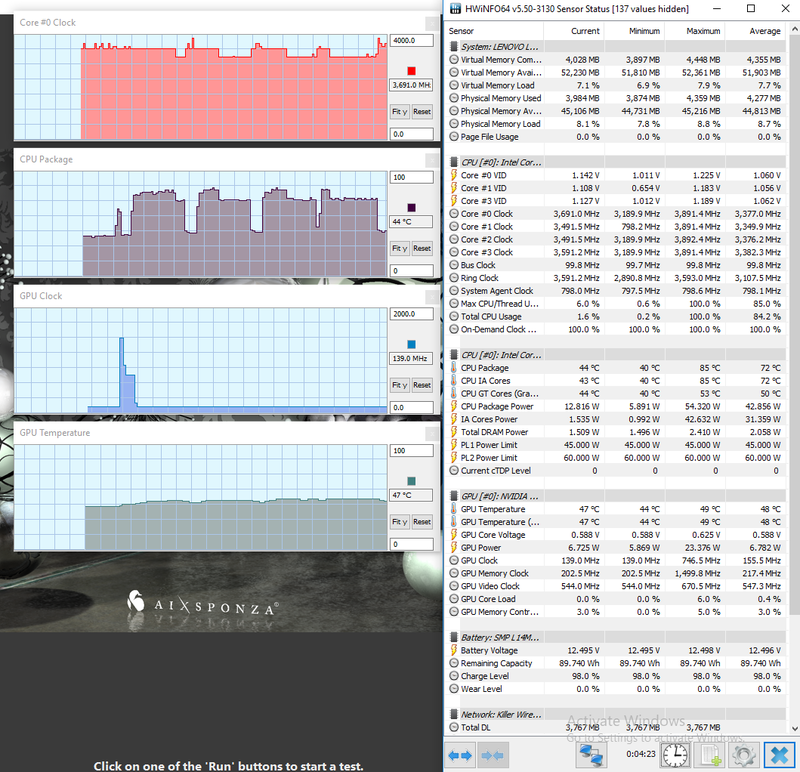 In fact, our unit is nearly maxed out, with 2x 512 GB SSDs, a 1 TB HDD, 48 GB of RAM and the Intel Core i7-7820HK processor. 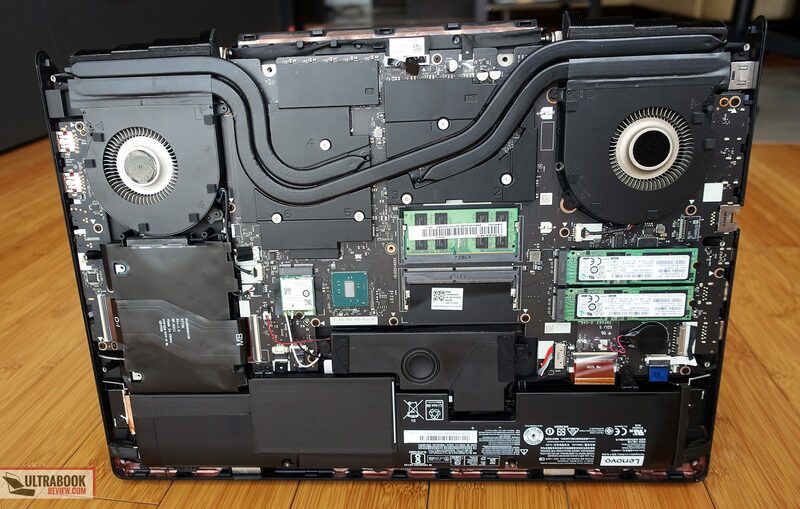 What you’ll find in stores usually comes with less RAM and just one SSD, but this laptop is fairly upgradeable. 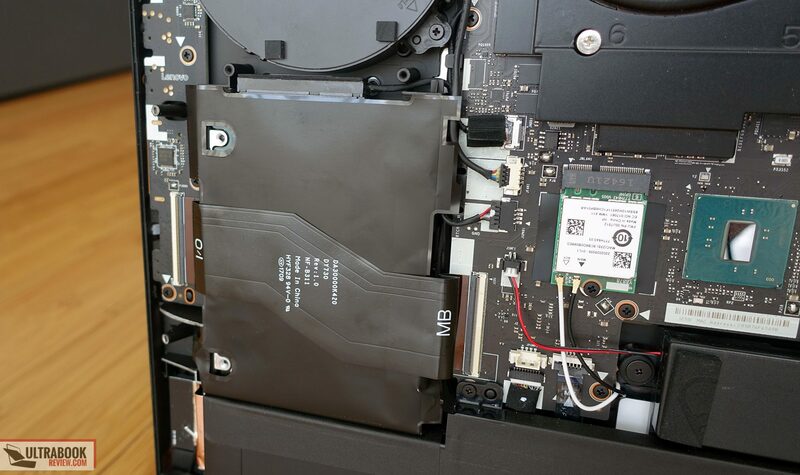 There’s no quick-access to the internals, but you can easily remove the entire back panel that’s hold in place by a handful of Philips screws. 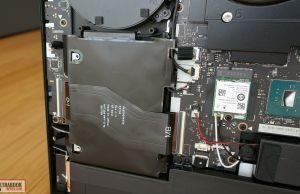 That’s going to give you access to the storage slots, the Wi-Fi, the battery and two of the RAM slots, with the other two placed beneath on the other side of the motherboard and more difficult the access. 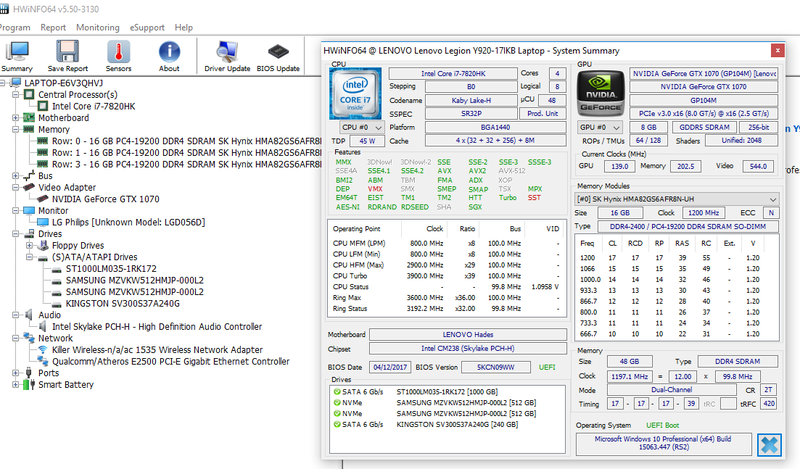 The big selling point of this configuration is the overclockable Intel Core i7-7820HK processor. 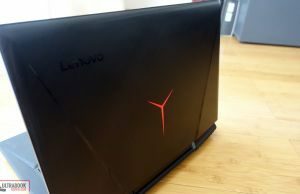 Lenovo does not offer the Y920 with a standard Core i7-7700HQ CPU at the time of this post, but they will at some point in the future. 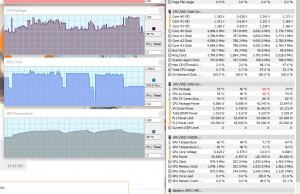 With most OEMs, the i7-7820HK is a $100 extra over the i7-7700HQ, runs a marginally higher frequencies and can be overclocked. 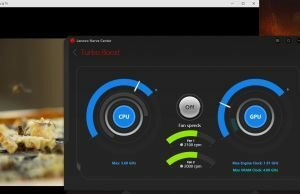 Lenovo makes the whole overclocking very simple on the Y920, there’s a toggle on the keyboard that activates the Turbo mode. 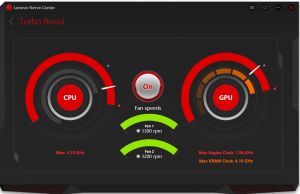 According to the Lenovo Sense app, the CPU is designed to run by default at up to 3.6 GHz on this notebook, with the GPU running at up to 1.91 GHz. 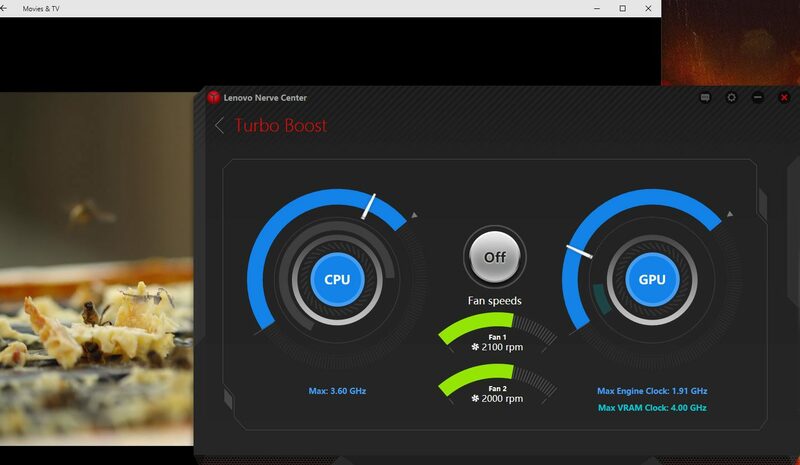 In Turbo, the CPU jumps to up to 4.1 GHz and the GPU to up to 1.96 GHz, and you can only activate this mode with the laptop plugged into the wall. In practice, things went a little different with our sample. 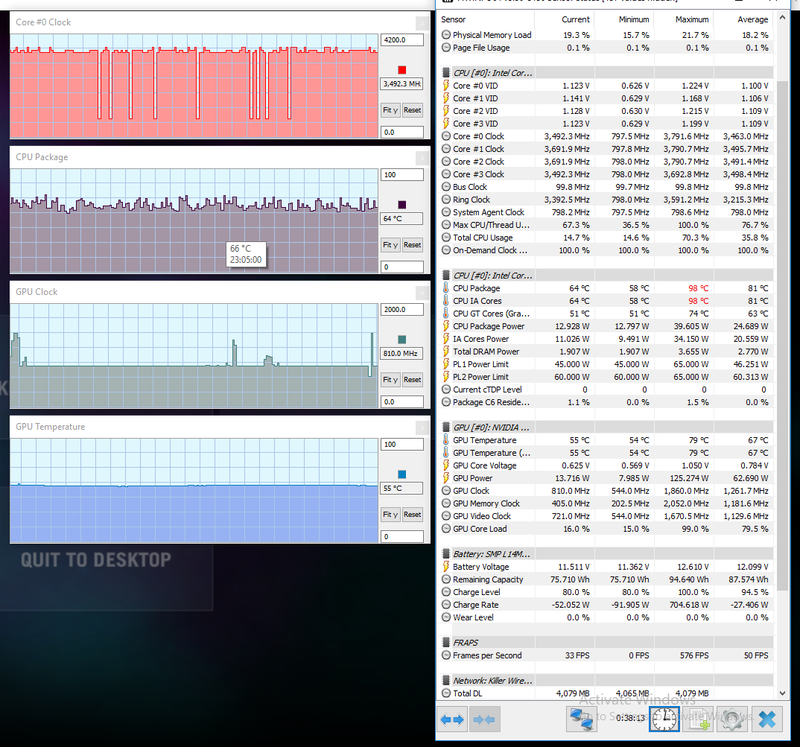 By default the CPU would spike up to 3.9 GHz on a single core, but average around 3.35 GHz across all cores in demanding loads, while on Turbo it would spike up to 4.1 GHz, again on a single Core, but average around 3.55 GHz in similar conditions. 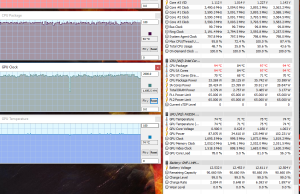 As far as the GPU goes, I haven’t seen it go above 1.835 GHz in standard Mode and 1.875 GHz in Turbo. 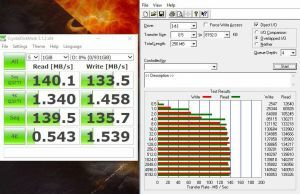 Keep in mind we didn’t test a final retail unit of the laptop, so take our findings with a pinch of salt, final version might actually run a little faster. 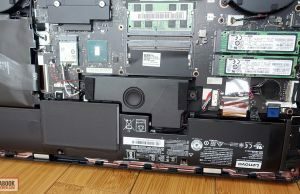 Still, these details matter as the Legion Y920 is the type of laptop people buy for the performance they can squeeze out of it. 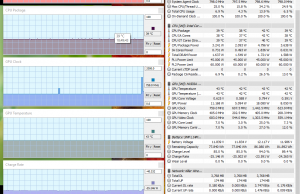 And here’s where I think this Lenovo fails a little short, at least to the maximum the hardware is capable of. 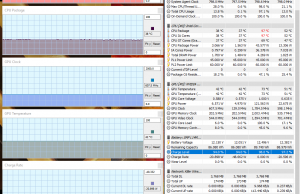 First of all, other OEMs allow to overclock the i7-7820HK processor a little higher and second, the hardware inside the Legion Y920 runs hot, which takes a toll on performance. 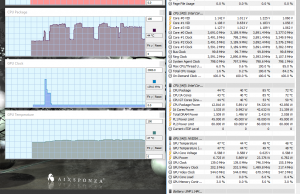 In fact, if you’ll look closely at the pics above you’ll notice that the high CPU temperatures (of up to 96 Celsius) cause slight frequency drops. 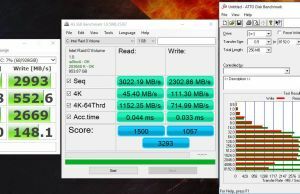 We’re of course talking TurboBoost speeds, so there’s no throttling here, but the CPU doesn’t run consistently at its top quad-core Turbo frequency in demanding loads, at least on this test sample, I encourage you to read other opinions as well. 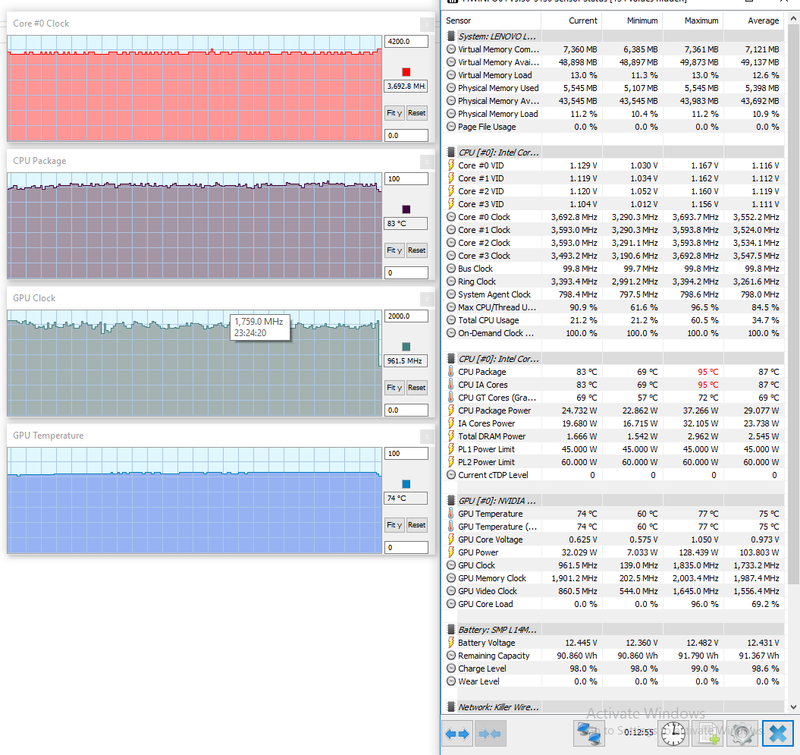 x264 HD Benchmark 5.1 64-bit: Pass 1 – 82.35 fps, Pass 2 – 15.80 fps. And here’s what we got on Turbo. These are very solid results, definitely better than we got on some of the other GTX 1070 laptops we tested in the past here or here. 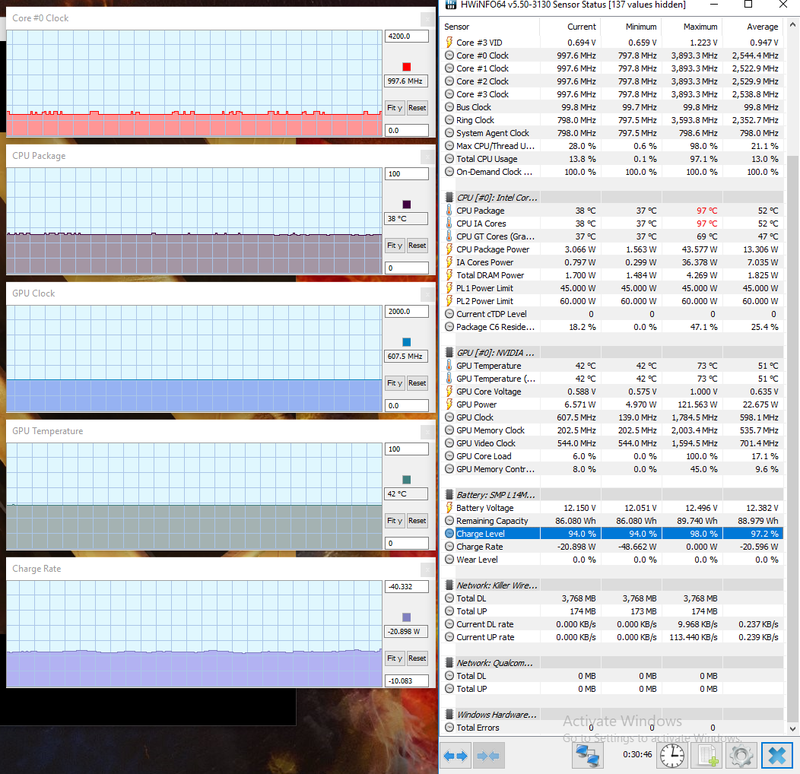 You’ll notice there are gains across the board in Turbo mode, as both the CPU and the GPU run at slightly higher clocks. 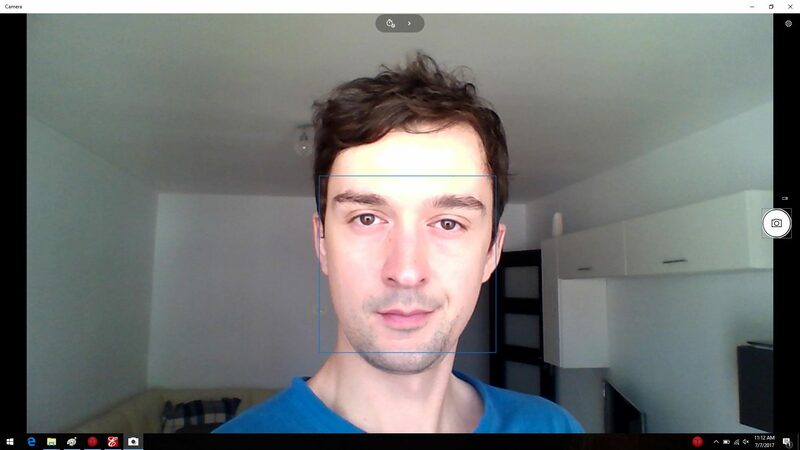 There is however potential for even better results with some tweaking. 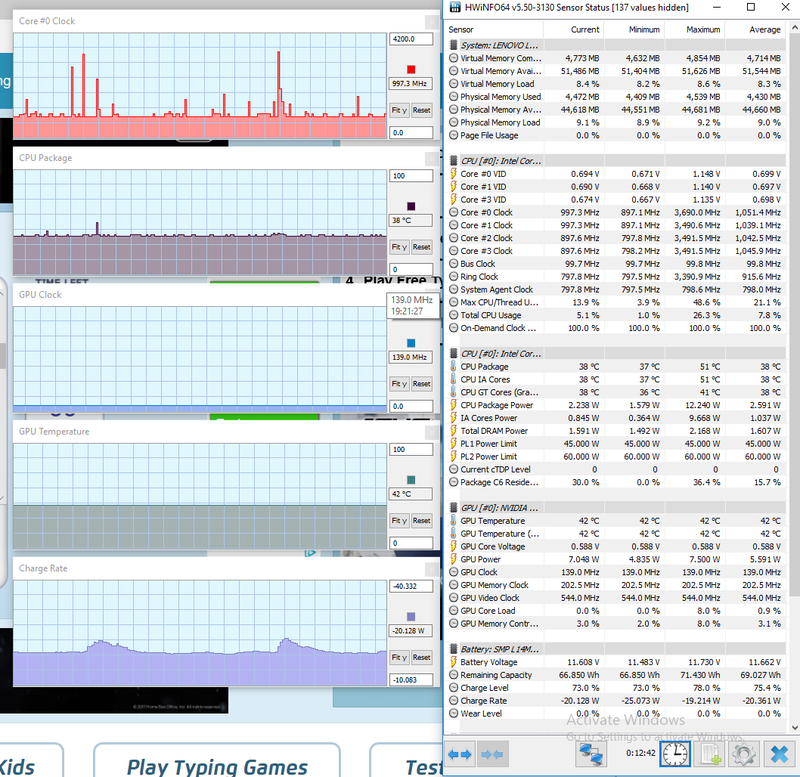 I’ve also tested a few games and noticed marginal increases in frames per second in Turbo. 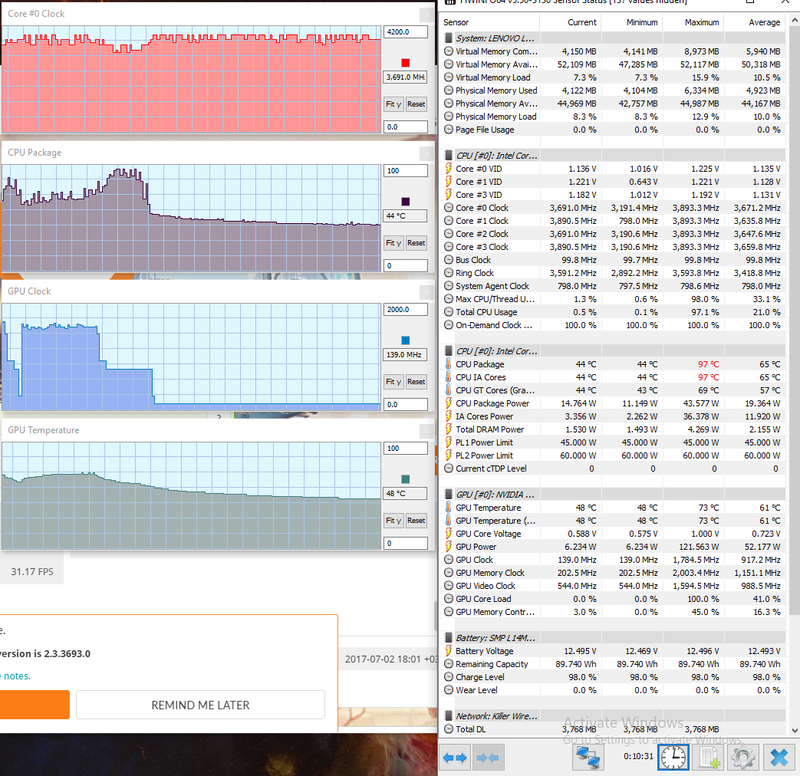 Thermals do limit performance (to a small degree) on this test sample, especially on Turbo. Of course, that’s with the stock paste, which is usually crap. 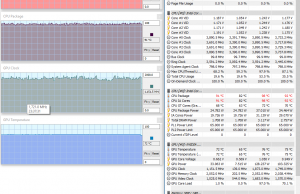 Just like with other notebooks with similar configurations, you can improve on both the scores and the temperatures by repasting the CPU/GPU (which however voids warranty) and tweaking certain aspects, like undervolting. In summary, the Legion Y920 performs well in games and demanding loads and the oveclockable CPU makes sense, but the gains are marginal in benchmarks and even smaller in games (1-3 fps). 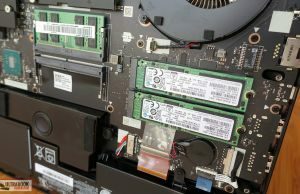 However, the out of the box experience can be improved in terms of performance consistency and temperatures, which those willing to take the laptop apart could achieve. 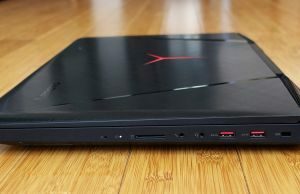 When it comes to gaming, I believe a Core i7-7700HQ version of this laptop would make more sense, especially one that would allow GPU overclocking. 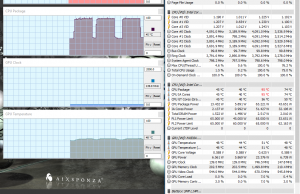 It would run cooler, thus more consistently, and it would cost less. As far as the daily use experience goes, the Legion Y920 works flawlessly and handles all sorts of tasks well. You’re not going to get that much in terms of battery life, due to G-Sync, but otherwise this runs smoothly, cool and fairly quiet. 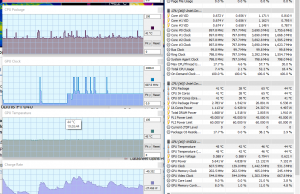 I’ve added some pictures that show internal temperatures and overall speeds with everyday tasks. 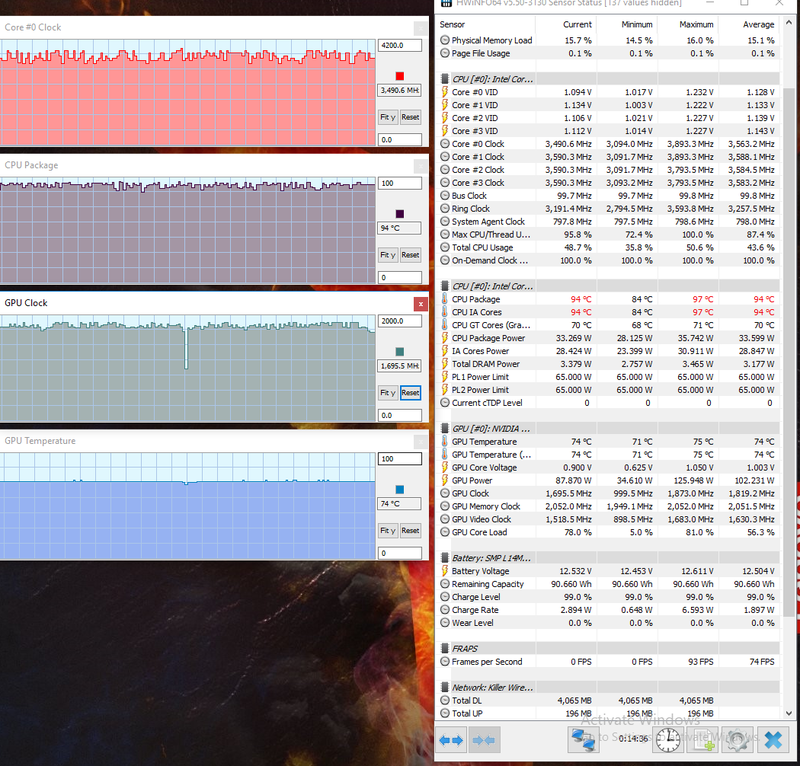 Of course, the i7-7820HK is going to make most sense for applications with a strong bias towards CPU processing, 3D rendering software, video editors, virtual machines, etc. 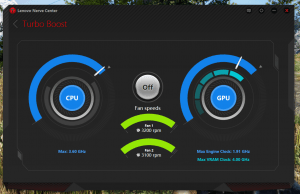 At this point, you’ll want to repaste and undervolt to get the CPU to perform better than it does out of the box, but you should also consider the other aspects that might influence your work results, like the screen’s finishing an average 72 aRGB color coverage, as well as the keyboard’s odd layout. 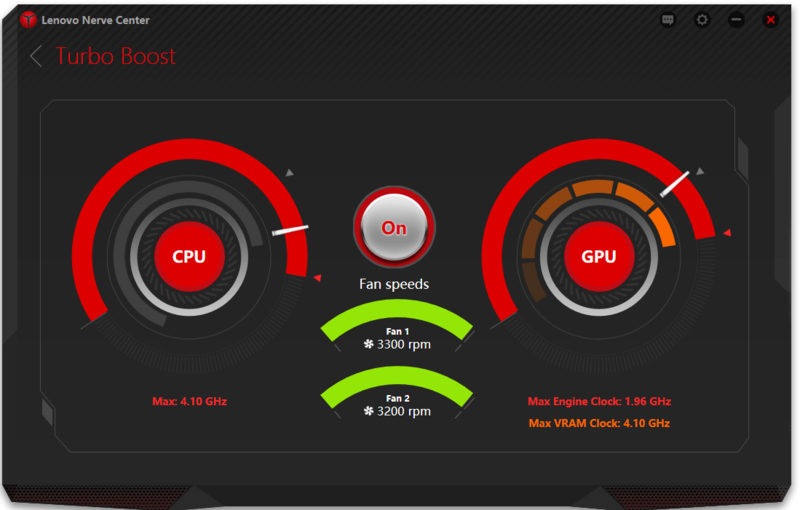 There are two fans inside this laptop and they are active all the time. With daily use they are however hardly noticeable in a normal environment, yet you’ll hear them in a very quiet space. We measured noise levels between 38-40 dB (they spin a little faster with heavier multitasking – between 2100 and 2400 rpm according to the Lenovo Nerve Center app) at head level in a perfectly silent room (environment noise measured at 35 dB with the same app). 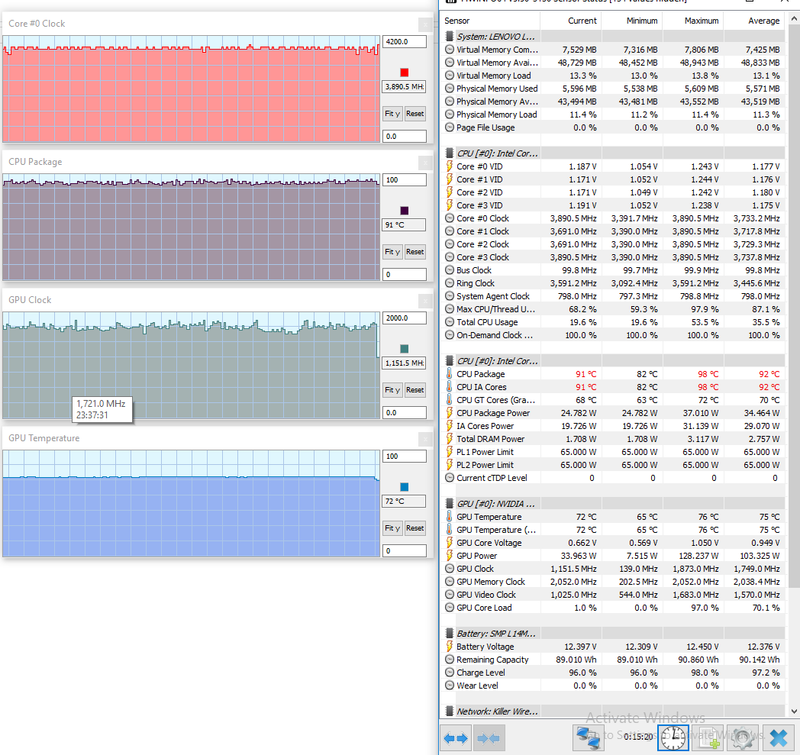 The spinning HDD is also a noise source if active. 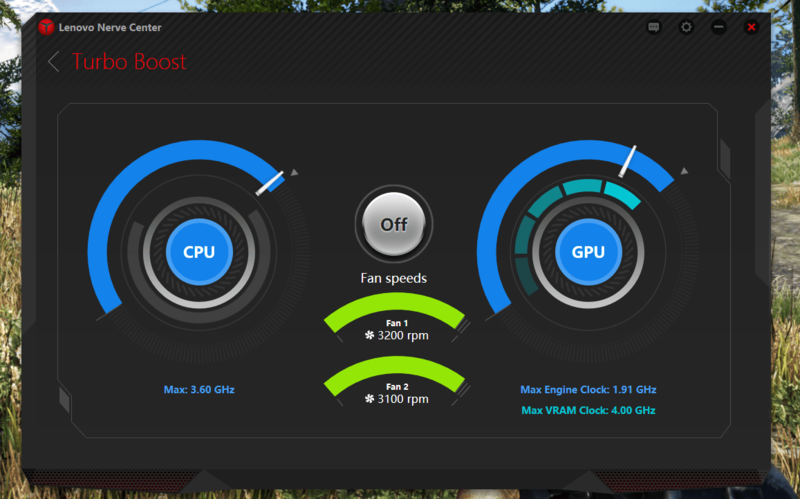 Under load the fans ramp up to 3300 rpm in the Normal mode and 3400 rpm in Turbo. That translates in noise levels of about 46-47 dB in Normal and 47-48 dB in Turbo modes, both at head level, which mean that this laptop can get noisy when playing games and you’ll need headphones to cover up those fans. 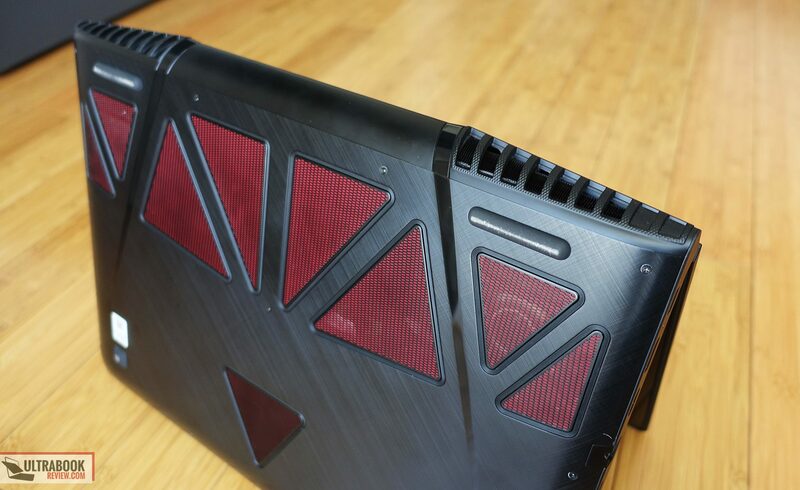 Despite the fact that the components reach temperatures of over 90 degrees Celsius (averages of 90 C for the CPU and 75 C for the GPU in games), the outer case stay within normal levels of up to mid 40s in the hottest regions, around the exhausts on the back edge. 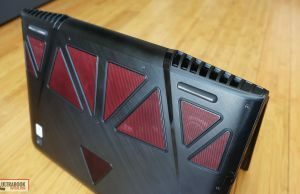 It’s worth however noting that this Legion gets overall warmer than the Alienware 17 and Acer Predator 17X we reviewed in the past, both of them with Core i7-7820HK CPUs and Nvidia GTX 1080 graphics, and that’s mostly because of the metallic chassis that heats up more aggressively than the all-plastic casing of those other two options. 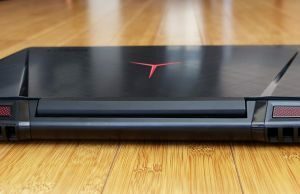 Still, given the fact that this laptop will stay on a desk most of the time and the fact that users won’t normally get in contact with the hottest areas, this aspect might not matter that much for potential buyers. 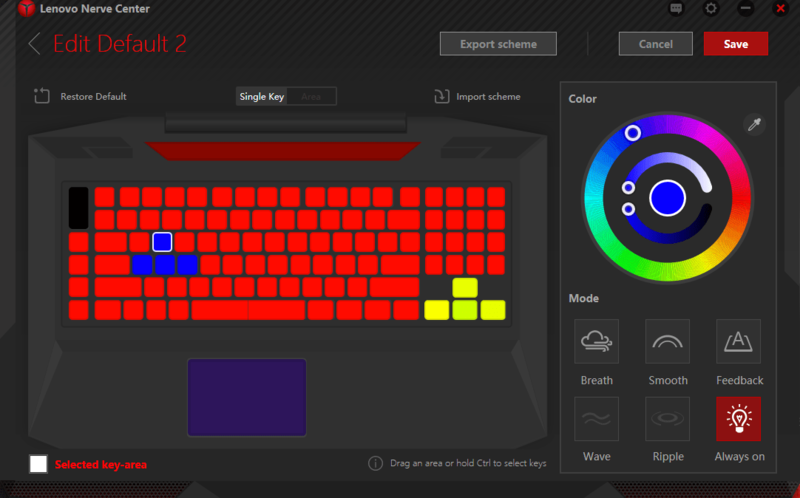 It’s annoying the interior and mid- keyboard area actually get hotter than the back though. 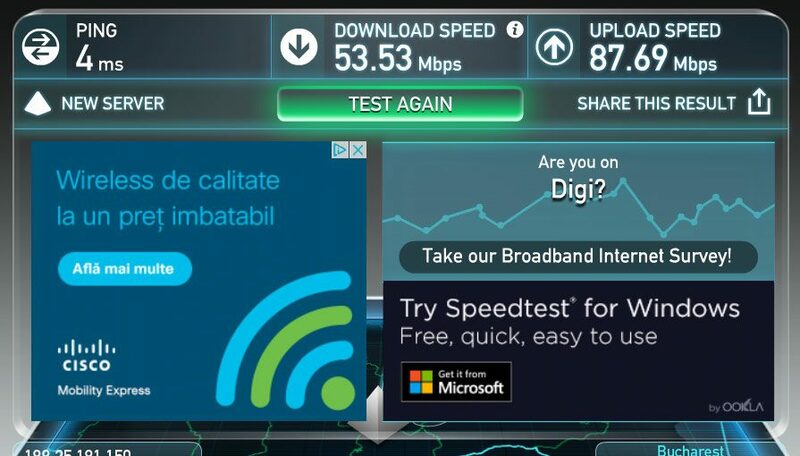 Connectivity wise there’s Gigabit LAN, Wireless AC and Bluetooth 4.1 on this laptop. 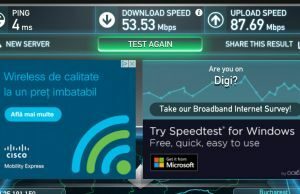 We mostly used it on wireless and the included Killer 1535 module did well when close the the router. 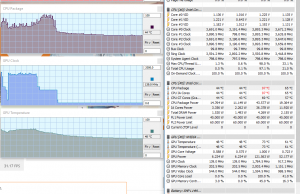 However, the signal strength and performance dropped massively at 30 feet with two walls in between, which was surprising, giving the same chip performs flawlessly on other notebooks. From what I can tell, the issue is caused by the metallic lid of this laptop that interferes with the antennae, an issue also noticed on the Lenovo Y720. I mostly blamed it on the wireless module in that case and didn’t think it had something to do with the metallic hood, but it probably does, now that we’ve experienced something similar here. 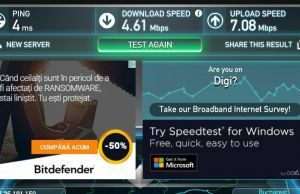 The bad news is that there’s no fix that I can think of, so if you have poor wireless signal in your office or room you’ll probably want to hook this up through the wired connection, or just look at something else. The speakers on the other hand are some of the better you’ll find on a laptop, with 2 x 2W speakers on top of the keyboard and a 3W subwoofer beneath. We measured a top volume of about 83 dB at head level, a little lower than on the Y720 which gets the same speakers as far as I can tell, but still loud enough that you won’t keep them at max in regular use. 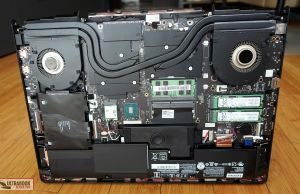 The sound coming out of this system is also punchy, clear and a with a fair amount of low-end, as much as you can expect from a notebook, of course. I haven’t noticed any distortions, but the woofer does push vibrations into the main deck, noticeable at volumes above 50%. As a side note, I also noticed some strange buzzing coming out of the top left speaker in certain games (Shadow of Mordor, Total Wat Atilla), but not in the others I’ve tested, so I couldn’t find an explanation or a way to reproduce this consistently outside of those titles. Still, it’s something I ran into and I considered that should be shared, as a potential warning. I do recommend using headphones in games anyway, because albeit these speakers are quite capable, they can’t completely cover the noisy fans in. The last thing we’ll mention here are the camera and mics, which can do their job, but are not memorable by any means. 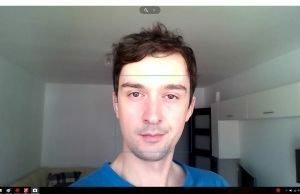 I’d recommend using a proper external camera if you plan to stream from this laptop. Lenovo puts a 90 Wh battery on the Yoga Y920, which is what I’d expect from a machine of this size. 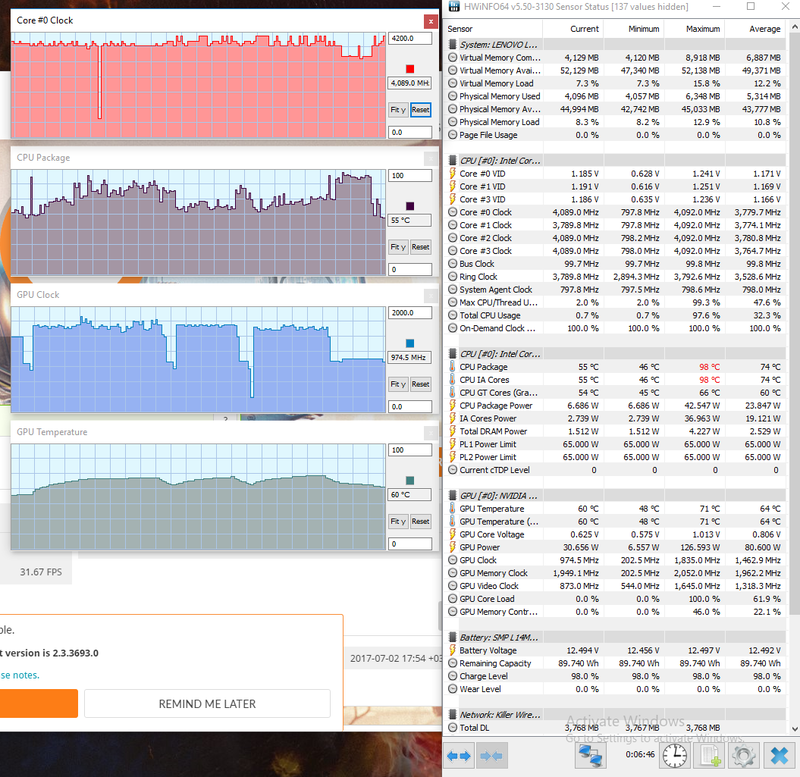 50.0 W (~1h 40m of use) – gaming, High Performance Mode, screen at 30%, Wi-Fi ON. 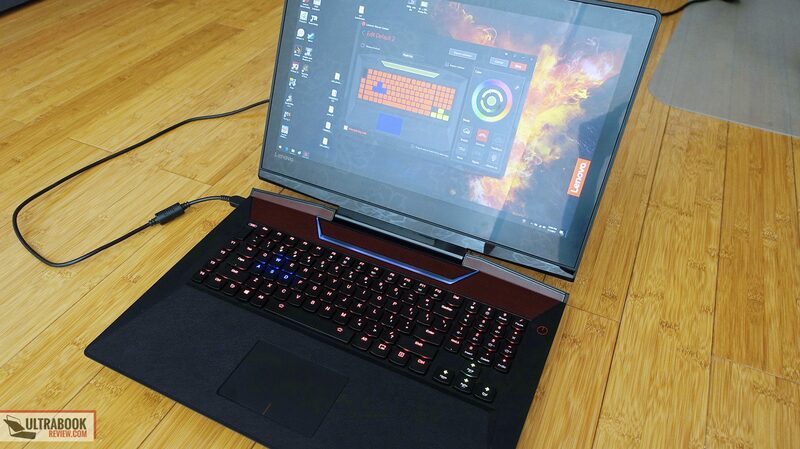 The laptop comes with a 230 W power brick and a full charge takes around 3 hours, even longer if you’re playing games during this time. It weighs around .9 kilos, so it’s not lighter than other options, despite its particular flat shape that looks quite compact. 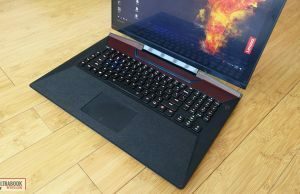 As of early July 2017 the Lenovo Legion Y920 is available in stores is some regions around the world. 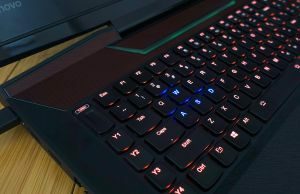 There’s only one model listed in the US, which sells for $2299 and includes the Core i7-7820HK processor, 16 GB of RAM, a 512 GB NVMe SSD and 1 TB 5400 rpm HDD, as well as the GTX 1070 graphics and 75 Hz IPS screen. 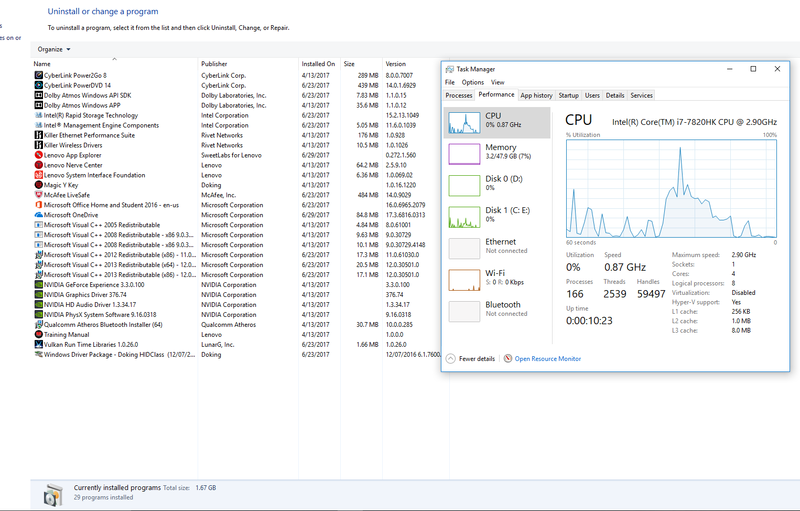 Personally, I’d look at a configuration with a Core i7-7700HQ processor and a 256 GB NVMe SSD if available, as that would save around $300 on the configuration above and give pretty much the same performance in games. Most of the components are easily accessible without voiding warranty, so this base configuration would give room for upgrades if needed, at a cost and time of my choosing. 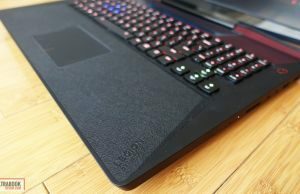 Aorus X7 v7 – $2500 – Core i7-7820HK, GTX 1070 8 GB, 8 GB RAM, 256 GB NVMe SSD + 1 TB HDD, WQHD+ IPS 60 Hz screen with GSync, 94 Wh battery, 7.1 lbs. 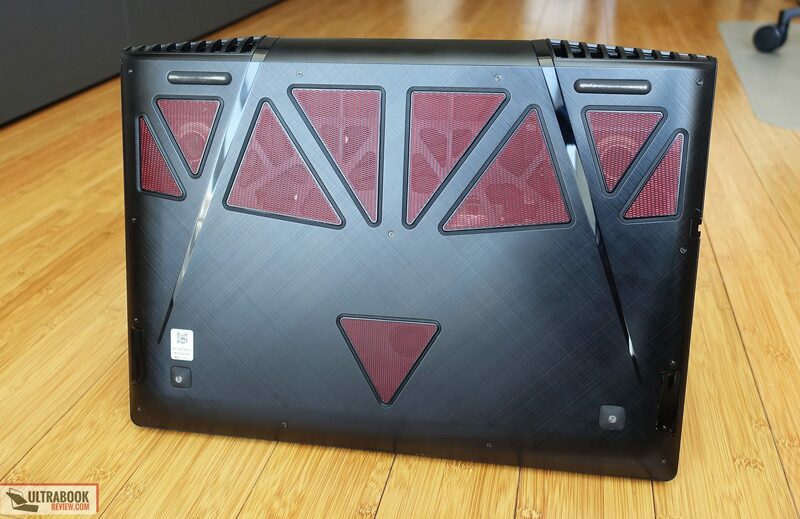 The ROG Strix stands out with the good price and the higher refresh rate screen, the Aorus with its portable form-factor and the Alienware with the higher resolution screen, overclocked GTX 1070 chip and customizable configurations. 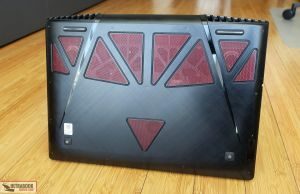 Acer Predator 17 G9-793 – $2000 – Core i7-7700HQ, GTX 1070 8 GB, 16 GB RAM, 256 GB NVMe SSD + 1 TB HDD, FHD IPS 60 HZ screen with GSync, 88 Wh battery, 9.4 lbs. 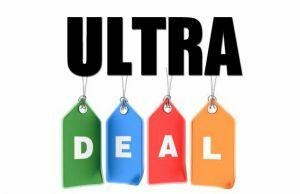 In this segment there are plenty of thinner and lighter options, as well as a handful of full-size laptops that sell for under $2000. 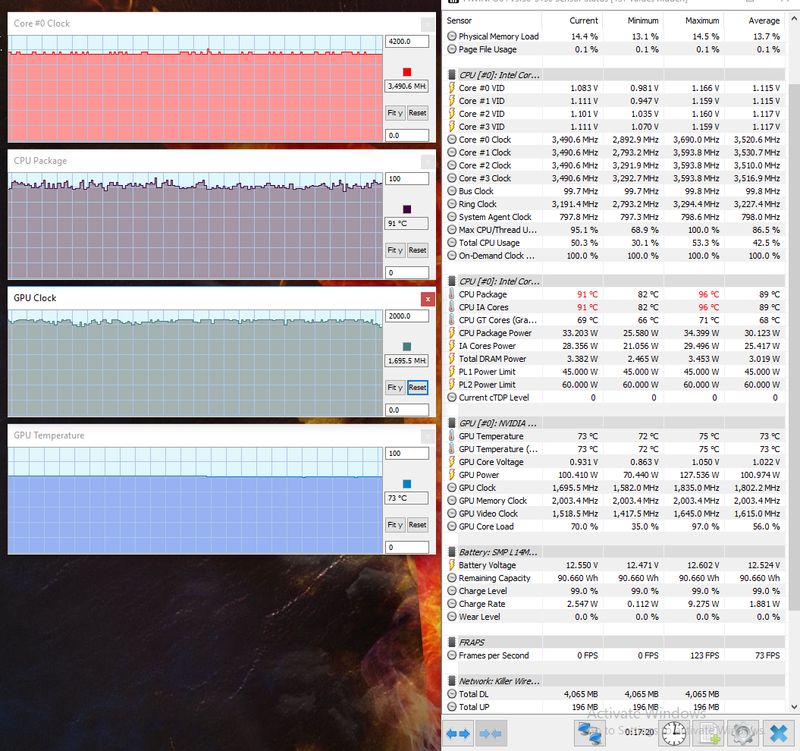 I’d expect the Legion Y920 Core i7 configuration with 256 GB SSD to sell for under $2000 as well, when available. 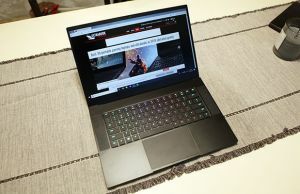 At the end of the day, the Lenovo Legion Y920 is one of the best buys in its niche, that of full-size high-performance laptops with a 17-inch screen. 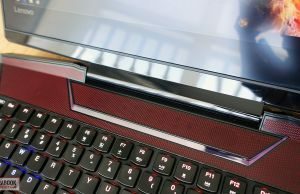 It has a few flaws, but most of them aren’t deal breakers, like the fact that the screen gets a reflective coating, the fact that the fans are loud and the metallic case gets a little too hot for a laptop of this heft. 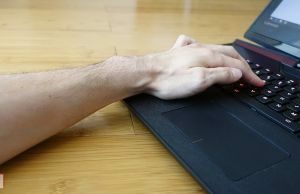 Some of the quirks could steer you away though, like the poor wireless performance at range and even the keyboard, which is different from any other laptop keyboards, with an odd layout and a feedback that might not be up everyone’s alley. But then the keyboard is also one of the main aspects that sets this laptop apart from the crowd, so I encourage you to give it a go if possible. The build quality and clean design are also solid selling points for the Y920, as well as the great panel with GSync, the large battery, the excellent IO and speakers, and last but definitely not least, the performance. 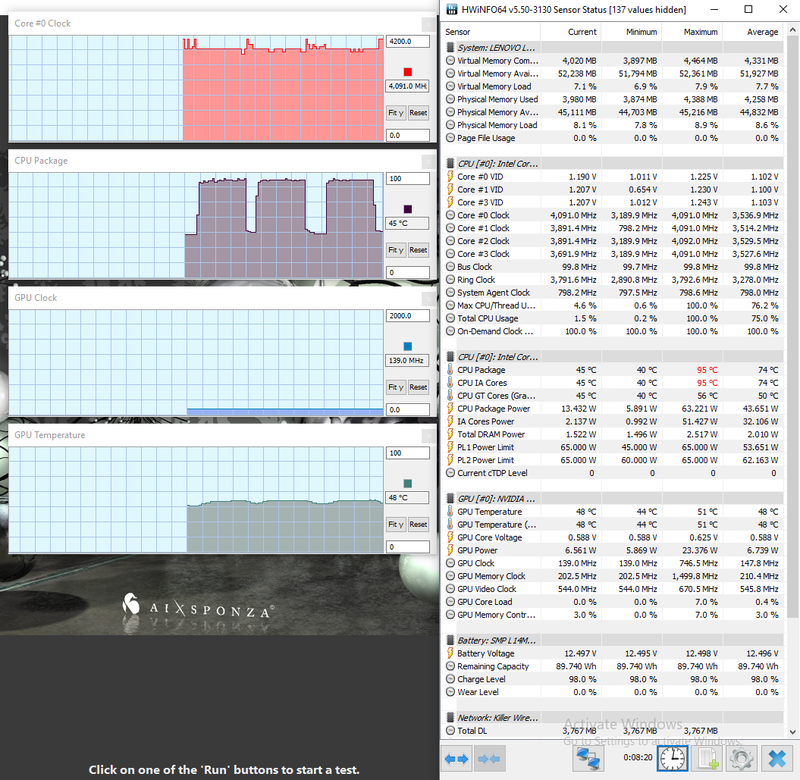 Our test unit did well in daily use and games, and while it wasn’t able to squeeze the absolute best the platform is capable of, I believe that can be achieved with further tweaking, like repasting the CPU/GPU and undervolting the CPU. 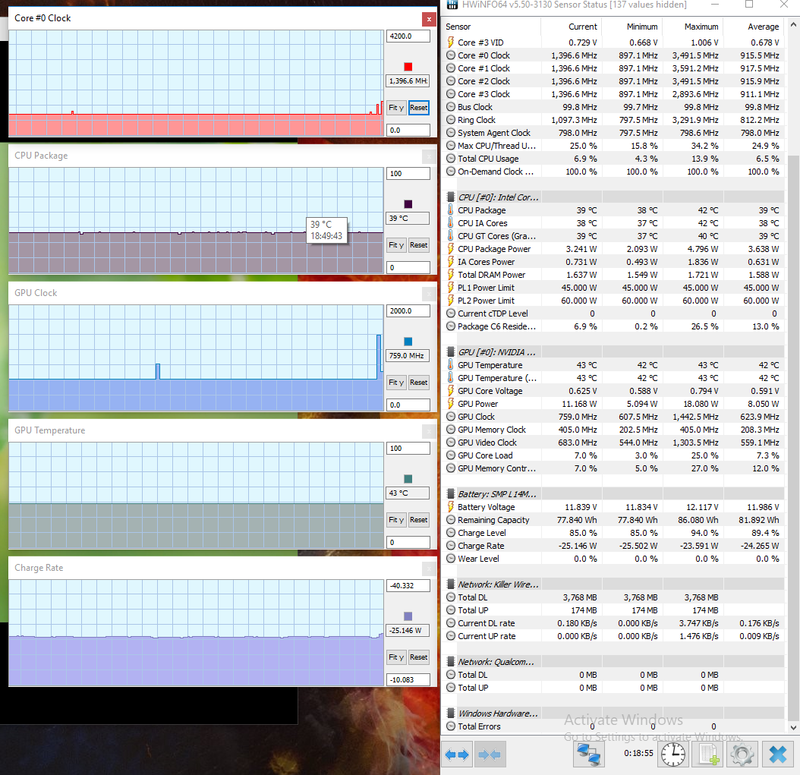 Of course, it would be great if performance would have been flawless out of the box, but I’ve yet to find a high-performance laptop that can do that just of yet. 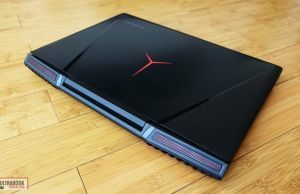 So at the end of the day this notebook is primarily designed as a gaming machine, one that will live most of its life on a desk, indoors; and as a gaming machine you’ll hardly find an option that would offer better value for the money, especially once the Core i7-7700HQ configurations will be available in stores and once prices drop a little, as with most other Lenovo laptops. So if you’re looking for a 17-inch gaming machine in the second part of 2017, you’ll have a solid pretender in the Lenovo Legion Y920, alongside options like the Alienware 17, MSI GS73 Titan and ASU ROG GL752VS. 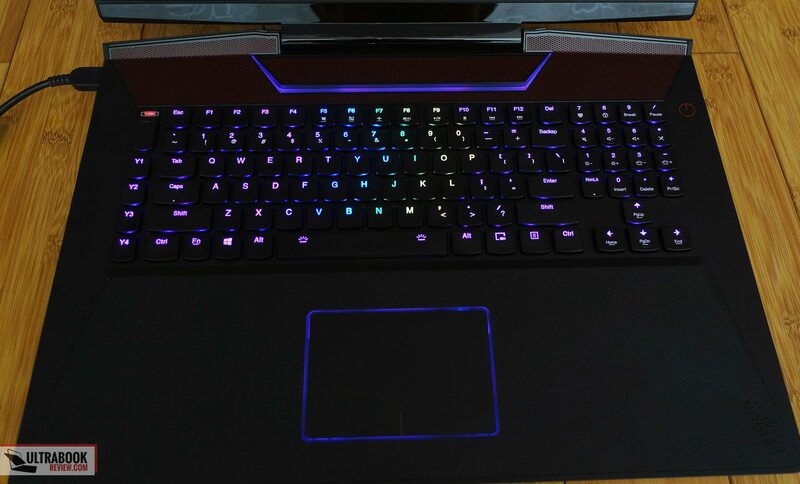 If you’re a professional and want a powerful laptop for work though, this one’s keyboard, reflective screen with only FHD resolution and average color coverage, as well as the high hardware temperatures, might make you look elsewhere instead. 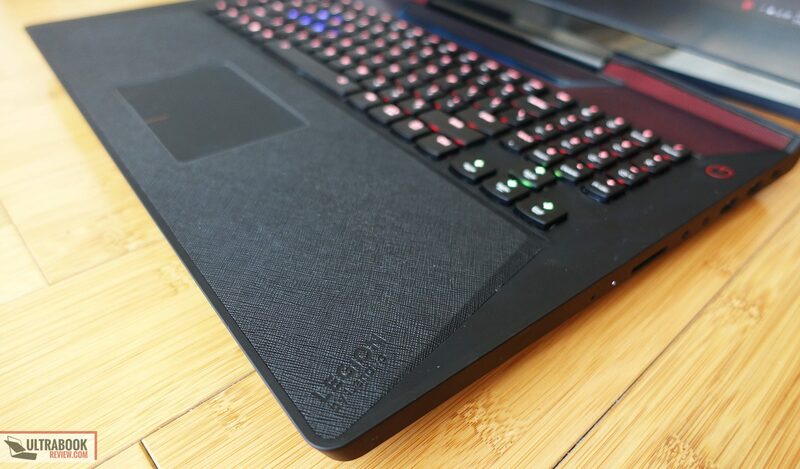 That wraps up our review of the Lenovo legion Y920, but he comments section below awaits your comments and feedback.